Dorner is exhibiting its new 3200 Series with ARB Technology conveyor, as well as its sanitary AquaPruf VBT platform, in booth No. 628 at PACK EXPO East 2017, Feb. 27 – March 1, in the Pennsylvania Convention Center, Philadelphia. Dorner is a manufacturer of packaged and custom conveyor solutions, solving industrial, packaging and sanitary conveyor automation needs for a variety of industries. 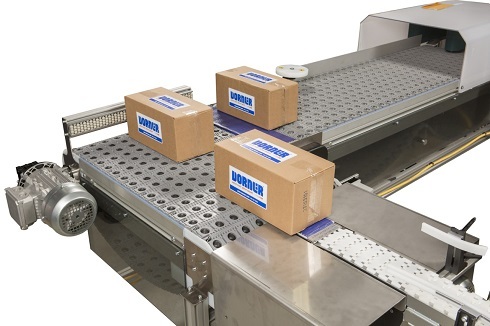 One of Dorner’s newest conveyors, the 3200 Series conveyor with Intralox Activated Roller Belt (ARB) Technology, is perfect for moving boxes and packages in merging, diverting and aligning applications. ARB Technology uses low and high friction angled rollers within the belt to help smoothly guide and align items of all sizes. This conveyor technology minimizes floor space, increases system reliability, eliminates costly system controls, provides a safer work environment, and can handle products as small as 6” x 6”. PACK EXPO East attendees can also see the AquaPruf (VBT) Vertical Belt Technology Conveyor, which moves bulk products in straight-up 90° sanitary applications and features a proprietary staggered sidewall belt that’s easy to clean and improves product release. The conveyor comes with an open frame design for quick cleaning, more effective product changeover, and overall less maintenance versus a traditional bucket elevator. The AquaPruf VBT is perfect for elevating bulk products such as vegetables, fruits/grains/nuts, popcorn, pet food, pharmaceuticals and small packages. Applications include elevation for walk-thru, hopper feeding, weigh scale feeding, general bulk handling, and sanitary environments. To see how these conveyor platforms can help your material handling applications, make plans to visit Dorner in booth 628 at PACK EXPO East 2017.